Whether you are on a diet and trying to cut calories or a diabetic looking to enjoy something sweet without the sugar, the natural sweetener stevia provides a good alternative. With no calories, no carbohydrates and a zero glycemic index, stevia provides the sweetness your baked goods need without the extra. Stevia is much sweeter than sugar, so a little goes a long way. Because of this, you have to adjust the other ingredients in your recipe to make up for the lost bulk. In addition, how much stevia you add depends on the form of stevia you have. Combine your recipe ingredients as directed until you get to the sugar. Replace the sugar with the stevia based on the type of stevia you have. Because stevia is so much sweeter than sugar, a direct substitution is not possible. For every cup of sugar your recipe calls for, replace with either 1 teaspoon liquid stevia, 1/3 to 1/2 teaspoon stevia extract powder, 1 tablespoon concentrated stevia liquid or 18 to 24 individual serving packets. For smaller sugar measurements, consult a stevia conversion chart (see Resources). Add your bulk filler ingredient. Because the substitution amount of stevia is so much less bulk than sugar, the recipe requires more ingredients to balance it out. For every cup of sugar you substituted, you must add 1/3 cup of liquid or bulk, such as applesauce, yogurt, fruit juice, egg whites or water. Mix all the rest of your ingredients together and follow the remainder of your recipe. While stevia does not contain calories or cause fluctuations in blood sugar, the American Diabetes Association recommends not overdoing it on any dessert products, even those made with stevia. Other ingredients in the recipe can contribute to spikes in blood sugar. 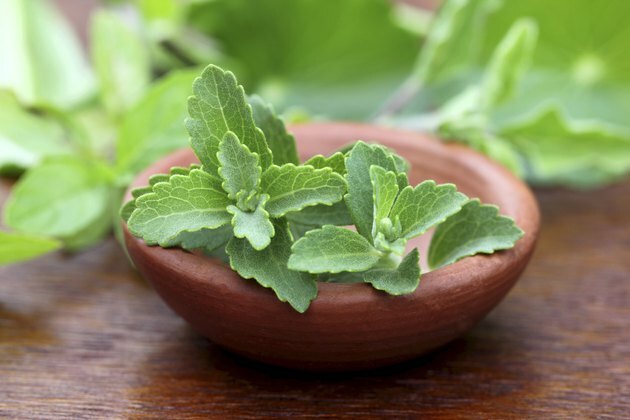 American Diabetes Association: Is Stevia a Safe Sugar Alternative for Diabetics?